101. Can you do a dml in constructor? 102. What are the data types that can be returned by a formula field? 103. Can you create a new profile from scratch ? Ans: No, you have to clone from a existing profile and modify the settings as required. 104. What are custom labels in saleforce? Ans custom labels are custom text values that can be accessed from apex codes and visualforce pages. 105. What is the character limit of custom label ? Ans: Custom labels can be only 1000 characters long, not more than that. 106. How long can a sandbox name be? Ans: It can only be of upto 10 characters not more than that. 107. Can you use sharing rules to restrict data access? Ans No, sharing rule can only give wider access to data it cannot restrict data access. 108. Can you edit a formula field values in a record? And: formula fields are read only and cannot be edited. 109. Can you edit roll up summary field values in a record? Ans: No, roll up summary fields are read only and cannot be edited. 110. 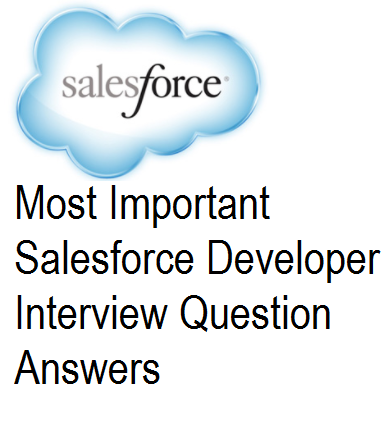 Ho can you create relationship between two objects in salesforce? Ans relationship can be set up by crating either look up relationship field or master detail relationship fields on objects. 111. Can you create a roll up summary field on parent object? Ans: Roll up summary fields can only be created if the relationship between objects is master detail type. Nice collection of questions. I have gone through all of them. Thanks. Happy New Year :) Thanks for all your efforts..Great collection!! Hello..Thanks for providing useful information..